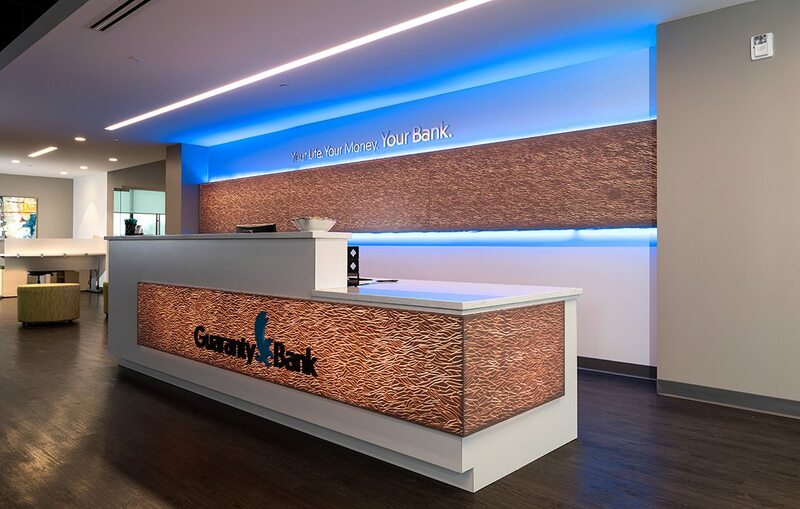 The new Guaranty Bank headquarters in Farmers Park is ushering in a new era of banking experience for customers and employees alike. By Brandon AlmsFirst-Floor Banking Center: When customers first walk into the bank, they are greeted by Branch Bankers, a title incorporating job duties beyond that of a standard teller to a concierge-type of service. Branch Bankers can help with any problem, solving issues quickly at the front desk or taking the conversation to private offices. The lack of a teller line is strategic: Robeson says Guaranty doesn’t want a barrier between associates and customers. Picture your bank. You walk in the front doors and are greeted by tellers behind a desk and offices lining the walls, right? 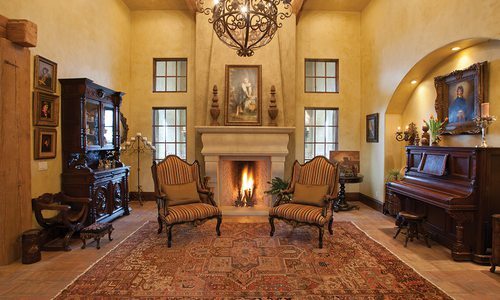 Guaranty Bank in Farmers Park doesn’t look anything like that… and that’s the point. The new headquarters occupies three floors of the newest building in the mixed-use development. Moving the headquarters and 60 employees to this new location was no small task. 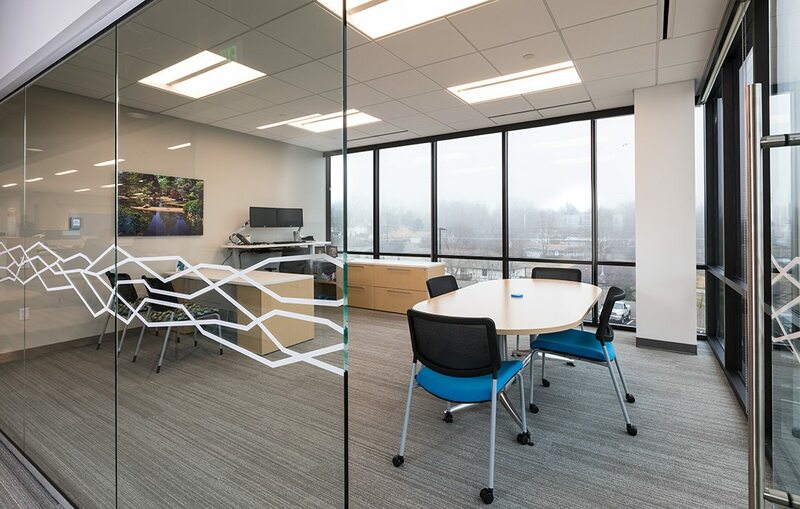 Vice President and Director of Marketing Carlye Wannenmacher and Chief Operation Officer Robin Robeson were part of a Guaranty Bank Branch Transformation Team that spent three years developing the project, which included a rebrand. The rebrand involved changing the traditional burgundy color to a bright blue, modernizing the fonts, and keeping the distinctive eagle logo but updating it to match the new scheme. The new branding helped inspire the base for what remodeled locations and new facilities look like. And the first example of that is the new banking center in Farmers Park. The Transformation Team went around the country to look at other banks and offices in other industries. It was important for them to compare the Guaranty Bank experience with other customer experiences and not limit what was possible by what’s happening in Springfield or in banking. “We wanted it to be a great place for four generations of employees to work,” Robeson says. To accommodate everyone, the design focused on balancing open and collaborative spaces with individual spaces. 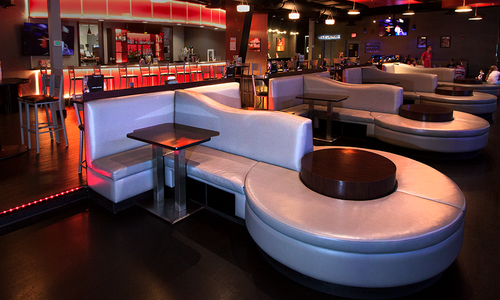 Customers were at the forefront, and the space serves patrons of all ages. Technology is a big part of today’s banking experience, but the team was deliberate about providing the experience in any way the customer wants to consume it—whether that be personalized and face-to-face or automated for speed. Success can be credited to the local partners and contractors who helped make the space a reality. 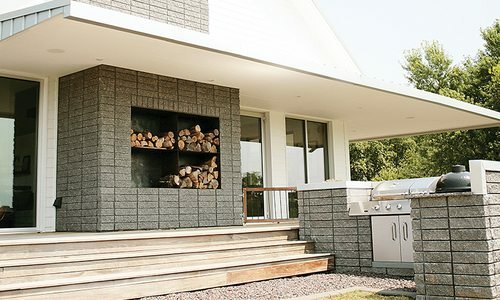 The company also worked with LEVEL5 LLC and Praxis3 out of Atlanta for the building design and architecture. These companies work with community banks and Robeson says it was a benefit that they already understood the business. Photos by Brandon Alms (Left) Rountree Collaboration Area: All of the common spaces, like conference rooms and group seating areas, are named after Springfield parks. Employees got to help pick the names for each area, and Wannenmacher says this helps the space feel like it’s part of Farmers Park and the Springfield community. These collaboration areas are open for client meetings or serve as spaces for associates who just need to step away from their desks to work. (Right) Community Table: The community table on the first floor is one of Robeson’s and Wannenmacher’s favorite places in the building. 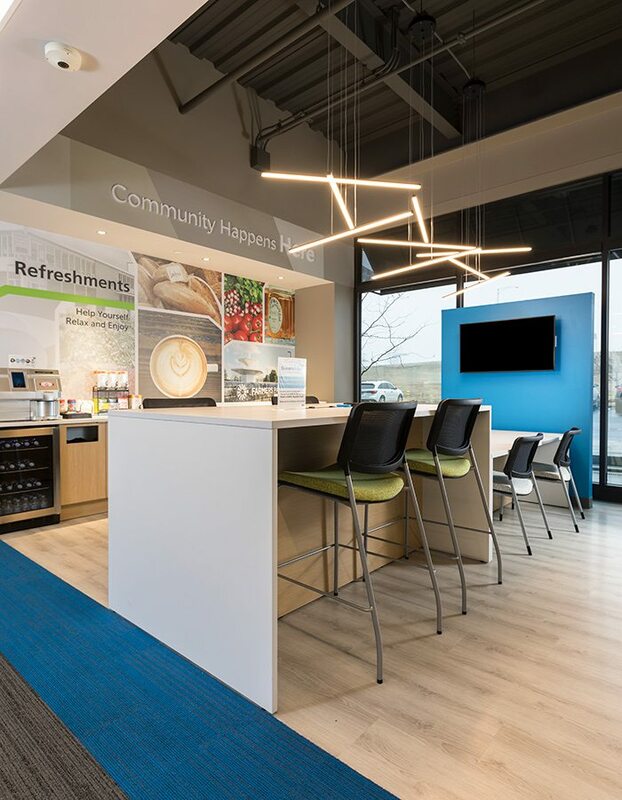 The meeting space is a community benefit—even if they don’t have banking business, community members can come here to work, recharge and sip coffee until their next meeting. The photos on the wall behind the refreshments were specially chosen to show Guaranty Bank’s 104-year history as a integral part of the community. Robeson and Wannenmacher are proud of this space and want citizens to be, too. “A bank can only be successful if the community is successful,” Robeson says. Photo by Brandon AlmsConference Room: Conference rooms are where the focus on flexibility is most evident. 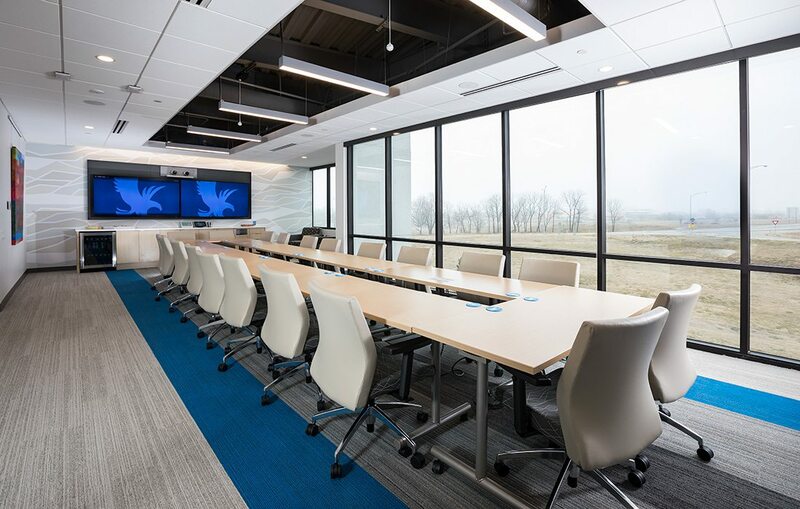 The tables can be adjusted to any arrangement needed, and televisions equipped for video conferencing allow team members at different locations to participate without missing a beat. 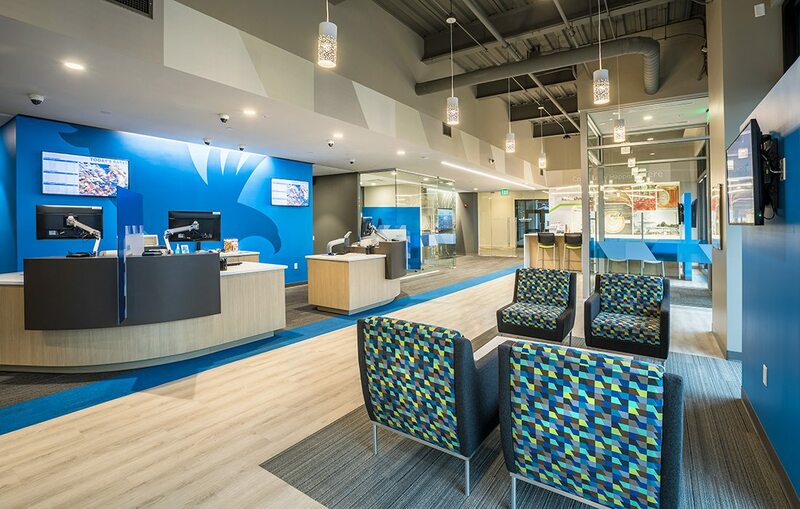 This is also where branding pieces come into play­—the carpet colors, wall graphics and upholstery all support the rebranded look of the bank. Photo by Brandon AlmsExecutive Office: All the offices on the upper floors are designed similarly to allow the spaces to meet every need, including having adjustable height desks. The personal touches even extend to the artwork. Wannenmacher spent a lot of time with the Springfield Regional Arts Council to get local artists’ work showcased throughout the building, and associates had a say in their preferred pieces. This further fosters the local ties and the idea that Guaranty Bank is a community bank for everyone. Photos by Brandon Alms (Left) Teller Cash Recycler: Innovative technology is at the forefront of the bank’s newest location. 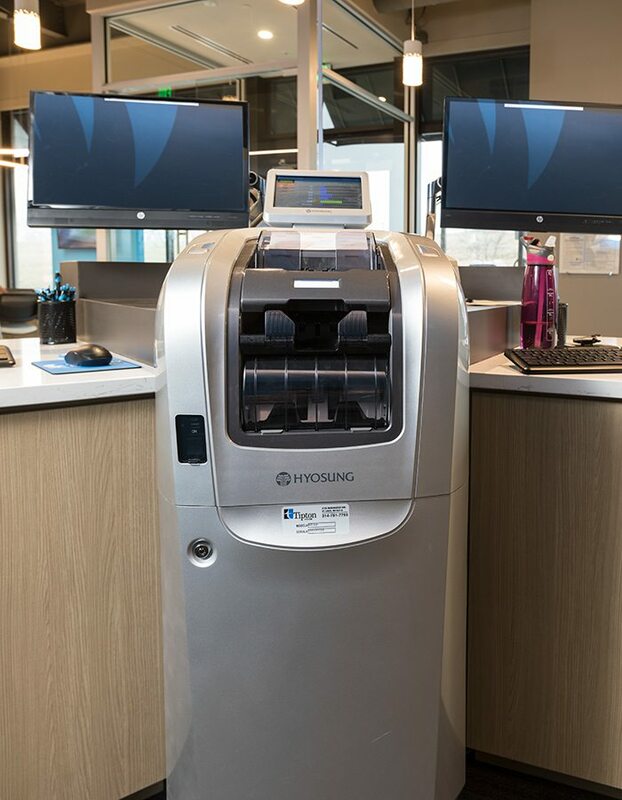 The teller cash recycler at the front desk is just one example of how technology allows the banking transactions to be more efficient so attention can stay on personal customer interactions. 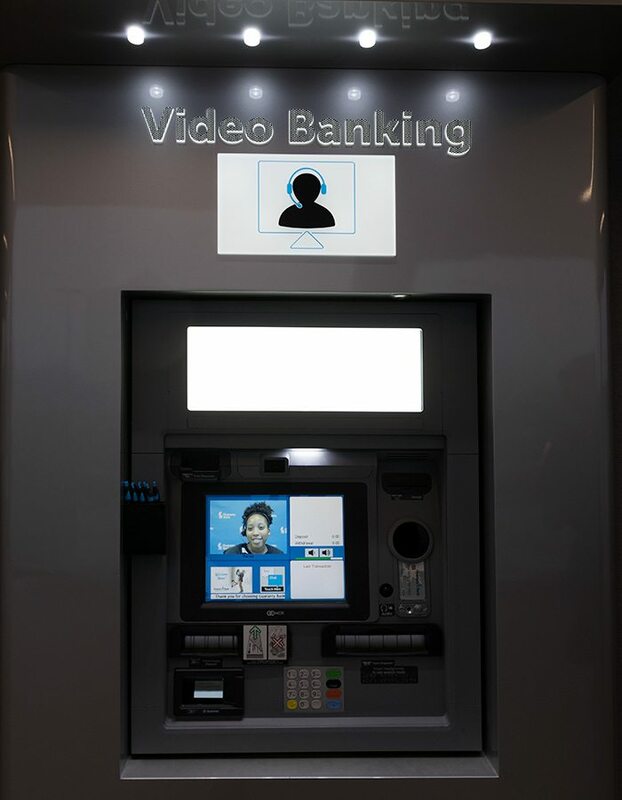 (Right) Video Banking Station: If customers need a quick transaction without stepping inside the bank, they can use the video banking station in the drive-through lanes. Customers talk to a representative on the screen, who is actually located at the operations center in Springfield. Customers can make deposits, make withdrawals or even cash a check to the penny. 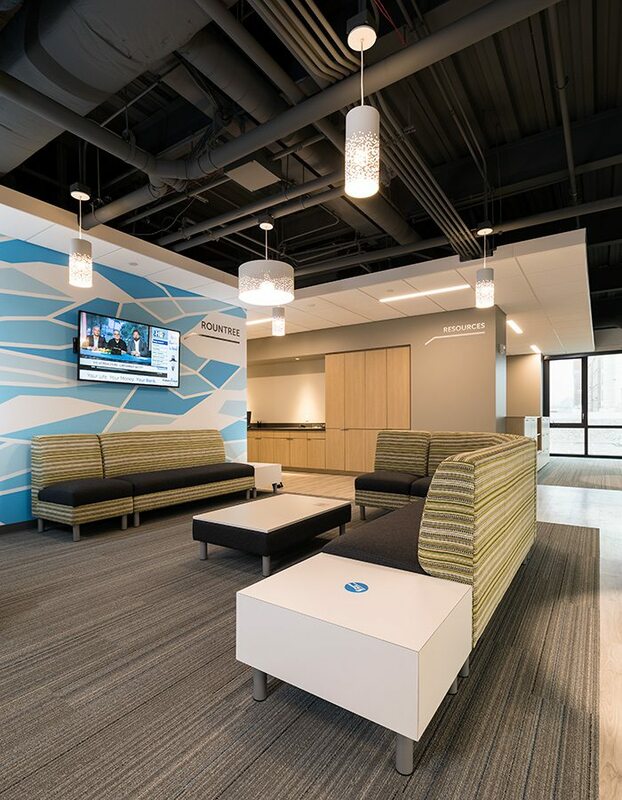 Photo by Brandon AlmsSecond-Floor Reception: As the anchor tenant in the building, Guaranty Bank occupies the first, second and third floors. The second-floor reception desk showcases the thoughtful design that took the Transformation Team three years to accomplish. Bold graphic lines represent eagle feathers, and the bank’s slogan is prominently displayed.